For Heerema, being a sustainable company means creating value by providing services that create economic, environmental and social value. Sustainability creates a business opportunity, a way to differentiate and achieve economic and social success. In other words, it is all about the triple bottom line (People, Planet, Profit). Heerema’s sustainability journey started in 2011, when the first sustainability report was written. Naturally, much has happened since then. In 2013, the decision was made to outfit the Sleipnir with dual-fuel engines running on LNG (one of the first in the world of its size) and in 2015 Heerema moved to a new office that was heralded as one of the most sustainable offices in the world according to the World Green Building Council. In 2017, with combined efforts from Heerema employees including upper management, a “Sustainability Roadmap” has been created. 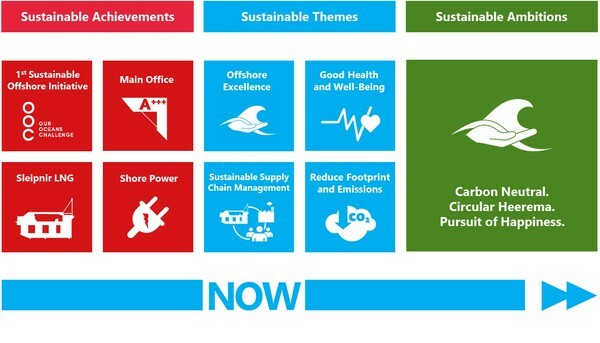 This roadmap provides HMC with a framework for sustainability targets in the years to come, as is shown below. The themes in blue are the central part of the roadmap and represent People, Planet and Projects. The goal of this Roadmap is to set a target for future ambitions and show the strategy on how to get there. Ultimately, sustainability projects aim to reduce cost, reduce waste, and naturally reduce our environmental footprint. In addition, these projects propel our sustainability agenda forward by creating awareness and engaging HMC employees. HMC uses themes, inspired by the UN Sustainable Development Goals to nurture sustainability awareness into our work practices. These sustainable themes represent our values and ambitions in achieving our sustainable targets. They are Offshore Excellence, Good Health and Well Being, Reduce Footprint and Emissions and Sustainable Supply Chain Management, which together achieve an optimum balance of the triple bottom line. Excellence is the fourth category which captures undefinable creativity and out of the box thinking. Though the achievements accumulate over the years, and our ambitions are adjusted as we progress in our sustainable journey, the themes remain the same. Each theme has its own projects with targets and persons to be held accountable to develop the sustainable agenda within the company. The main targets and projects for this year are listed below. A list with all the seperate initiatives Heerema can be found here. “From Values into Action”, Embed Sustainability Themes into the corporate and appoint account managers. Create a PR campaign to communicate HMC Sustainability Agenda internally and externally.